With Star Wars reinvigorating the outer-space concept, Filmation latched onto the craze for their next animated outing. The Young Sentinels took the concept of space-faring adventure and combined elements of Greco-Roman legend. While Filmation productions tended to feature a diverse cast of characters, this was notably the first production where the main cast matched that diversity. Promotional art featuring Astrea, Hercules and Mercury. Sentinel One (George DiCenzo), a technological lifeform from another galaxy, came to ancient Earth and took three teenagers back to his homeworld where they would be bestowed with incredible powers to make them saviors of the future. Hercules (DiCenzo), who had the strength of many men like his mythological namesake; Mercury (Evan C. Kim), who could move at super speeds again like in mythology; and Astrea (Dee Timberlake), a completely original creation that could transform into virtually any animal. Each also had the ability to fly and was rendered immortal by the process that gave them their powers. They were returned to Earth where they operated out of a ship situated inside an inactive volcano and protected Earth from a variety of threats; both alien and terrestrial. Assisting them and keeping the ship maintained was MO (Lou Scheimer), a maintenance operator droid that seemed to have a crush on Astrea. Sentinel One would communicate with his team through a holographic projection. Amongst the various threats they faced were their predecessor Morpheus (Alan Oppenheimer), a former Sentinel who had gone rogue; Agent Kronos (Ted Cassidy), a saboteur from the future; Fauna (Erika Scheimer), a young girl who was raised by animals and could communicate with them, and whose noble efforts to stop animal testing led to the creation of a Man-Wolf (Oppenheimer); and The Sorceress (Linda Gary), a powerfully magical being, amongst others. An add for NBC's 1977 Saturday line-up with the show's original title. The Young Sentinels debuted on NBC on September 10, 1977. The series’ music was handled by Ray Ellis and producer Norm Prescott (under their aliases Yvette Blais and Jeff Michael). The show was written by Kathleen Barnes, Donald F. Glut, Dale Kirby, Douglas Menville, Michael Reaves, Jerry Winnick, David Wise, Len Janson and Chuck Menville, with the latter two also serving as the story editors. The Young Sentinels languished in the ratings as it was competing against Hanna-Barbera’s Scooby’s All-Star Laff-A-Lympics on ABC. Halfway through its season, the show was moved to a different timeslot and given a new name: Space Sentinels. 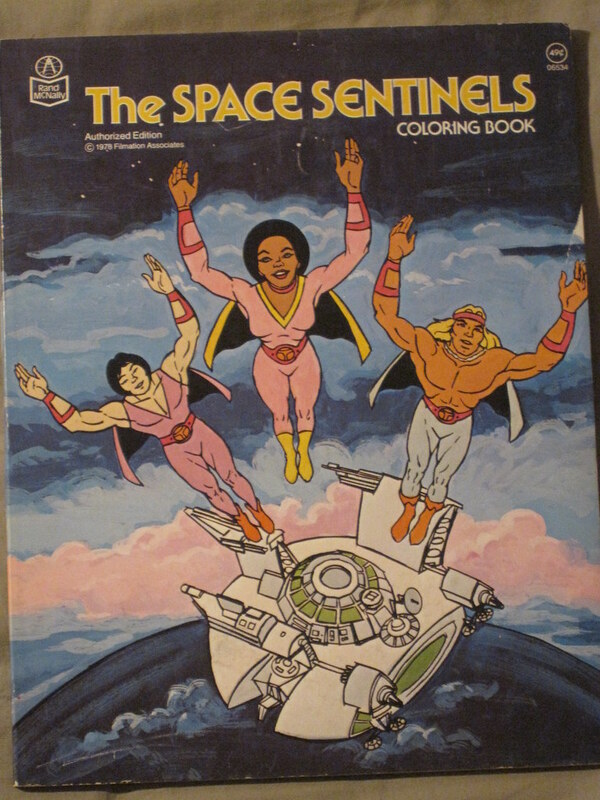 Speculation for the name change included the thought that NBC felt young viewers weren’t tuning into the show because they didn’t know what a “sentinel” was and that it didn’t sufficiently convey that the show took place in space, and to potentially stylistically link up to the CBS Filmation show Space Academy (on which DiCenzo also appeared). Unfortunately, those measures couldn’t help the declining ratings and the show concluded after 13 episodes. 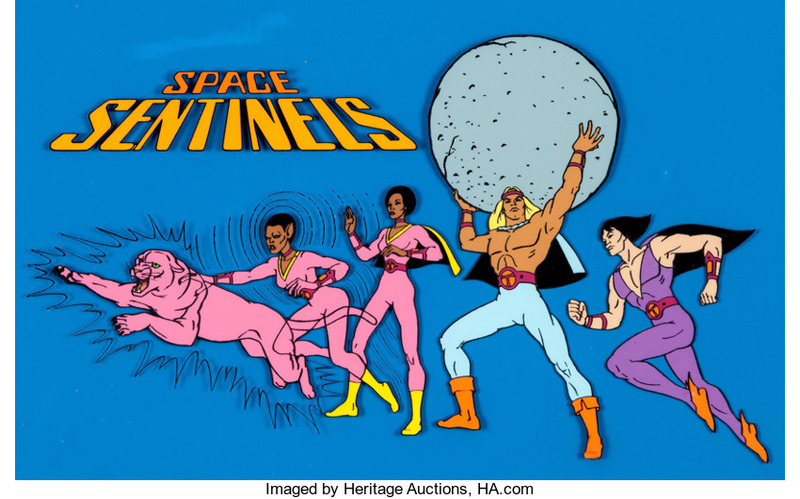 At least a portion of Space Sentinels would continue on as Hercules was included as a member of Filmation’s next hero effort, The Freedom Force, the following year. 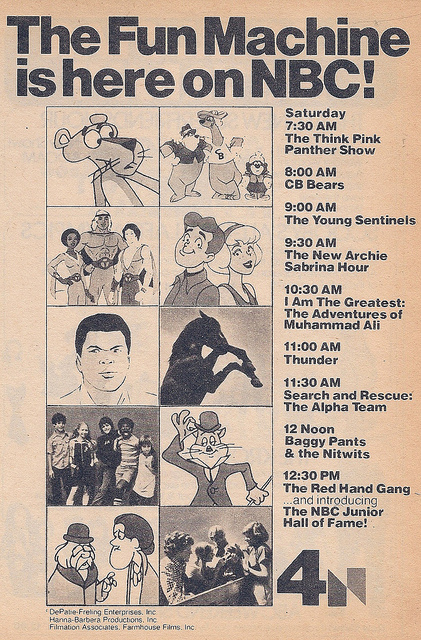 The even shorter-lived show ran as a segment of the new package show Tarzan and the Super 7. Rand McNally would publish several coloring books using images from the show, and Fleetwood Toys made magnetic figures based on the characters and a launching rocket. In the 1990s, several episodes were released to VHS by Untied American Video Corp. In 2006, the complete Space Sentinels was released onto DVD by BCI Home Entertainment along with the entirety of The Freedom Force. In 2008, BCI released a compilation collection called Heroes and Heroines which featured a disc from their earlier Blackstar, Secrets of Isis and the Space Sentinels sets. “Morpheus: The Sinister Sentinel” (9/10/77) – Former Sentinel Morpheus kidnaps MO in order to copy his memory and create his own Sentinel One. “Space Giants” (9/17/77) - Robots sent to rob a government gold vault realize they are superior to humans and create an army to wipe out mankind. 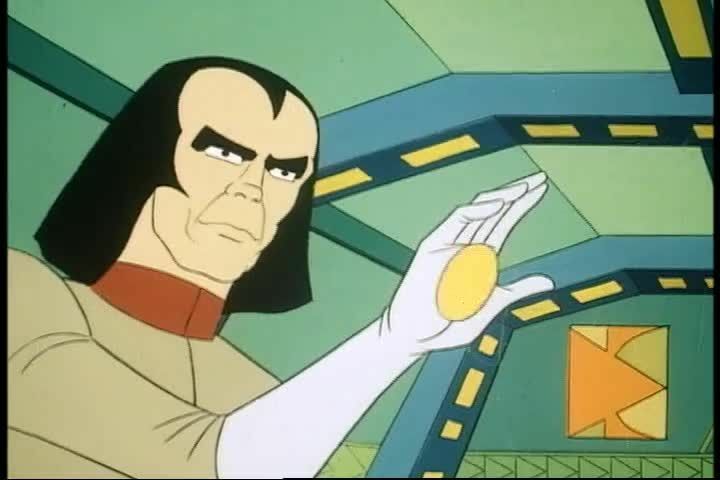 “The Time Traveler” (9/24/77) – Time-traveling Kronos comes from the future to steal plans for a space station, and Hercules and Astrea track him down to prehistoric times. “The Sorceress” (10/1/77) – The Sorceress makes the North Pole vanish and imprisons the Sentinels in their own imaginations when they investigate. “The Return of Anubis” (10/8/77) – Archaeologists accidentally free Anubis from his pyramid prison and he plots his revenge on mankind. “The Wizard of Od” (10/15/77) – An elf asks the Sentinels to come to the land of Fancia where a wish machine threatens to disrupt the natural laws and destroy every universe. “The Prime Sentinel” (10/22/77) – The Sentinels head to battle an energy-absorbing blob and rescue their leader. “Commander Nemo” (10/29/77) – The Sentinels have to stop Commander Nemo from exacting his revenge on those who pollute the oceans. 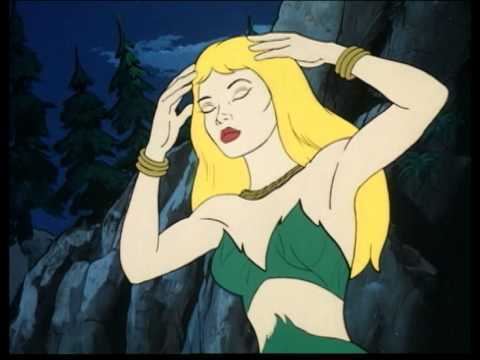 “Voyage to the Inner World” (11/5/77) – Dying Queen Darkari captures Astrea in order to siphon her brain waves. “Loki” (11/12/77) – Telekinetic giant Loki is freed from his prison and he takes the Sentinels’ ship in order to exact his revenge on his jailer. “Fauna” (11/19/77) – A girl who can communicate with animals attacks an animal testing lab, which leads to a wolf mutating into a man-beast bent on revenge against humanity. “The Jupiter Spore” (11/26/77) – A spore brought to Earth from Jupiter begins growing at a rapid rate, sending the Sentinels to the planet to find a solution. 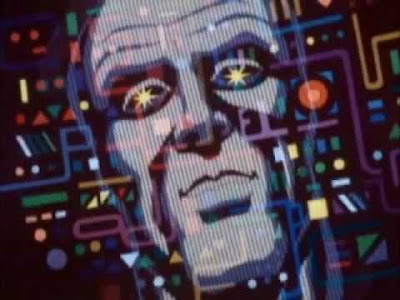 “The World Ship” (12/3/77) – The Sentinels head to stop a planetoid from crashing into Earth only to learn it’s a ship whose captain plans to steal the planet for his own people.